Looking for a nice beach in Bali? One with beautiful beach sand and beautiful turquoise, wild waves that you can just throw yourself into? 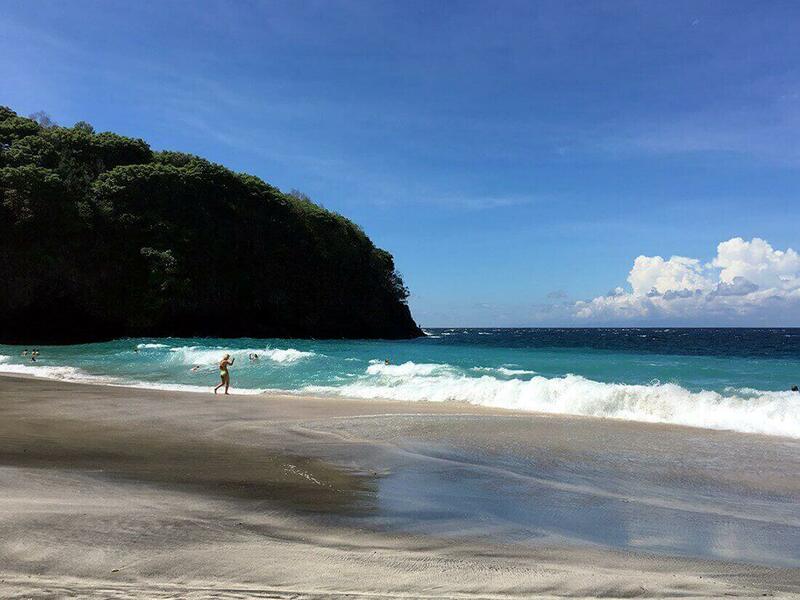 Should you be around Candidasa area, do not hesitate to drop by the Virgin Beach! The beach is really beautiful! You drive down by JI. Pantai Perasi (see map at the bottom of the article) and park the car. Then you go down through the woods to get to the beach. As soon as you get to the beach, the ocean waves rush against you – as you walked right into them! The sand is white, fine and nice to walk in. If you buy a drink or lunch at one of the beach cafes, they offer you a lounger with shade. Can your child swim at Virgin Beach? We saw a lot of children swimming in the big waves. Many of them were the aged 9-10 years. There were also very young children swimming, however it was only locals. The waves was real big that day, and we were warned that there was alot of undercurrent. We noticed it ourself – Sebastian was easily pulled out, even if we just sat in the sand and was playing. Because he recently just learned to swim, a week earlier – in a swimming pool in Ubud, we thought it was too risky to let him swim in the waves. 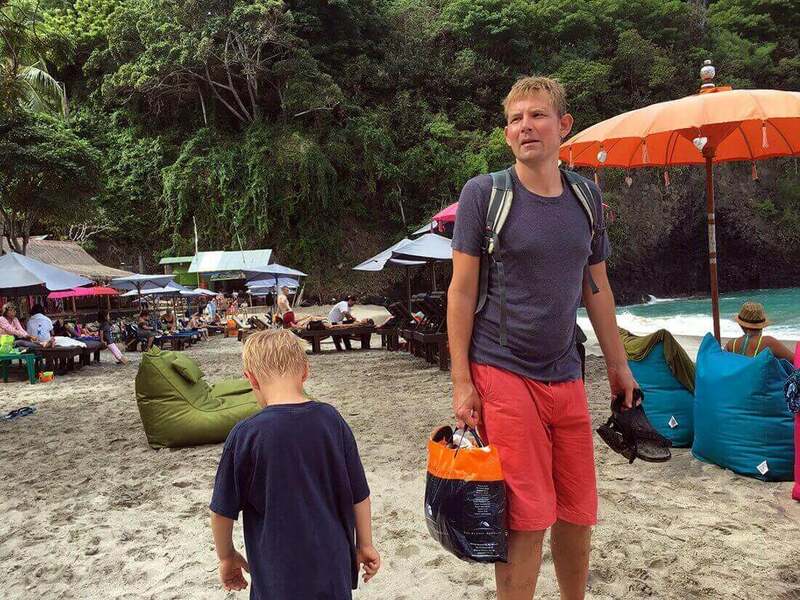 Virgin Beach – is also known as “The White Sandy Beach” (especially among taxi drivers who will drive you out there), it is located 7 km east of Candi Dasa, Bali. Take a taxi to the beach, and agree with the taxi driver on when to come and pick you up again. Our taxi driver waited on the beach, while he enjoyed some food and a drink – at the food stalls by the parking area. Bring some food with you. The food that we bought, at one of the beach-stalls, it was spoiled and outright disgusting. Beware of the undercurrent – especially if you have small children!